Dr. Spencer is originally from Harrisburg, AR. He received a B.S. in Biology from ASU and then got his degree in medicine from the University of Arkansas for Medical Sciences. 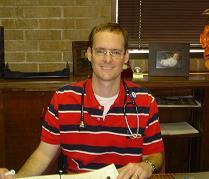 Following medical school, he completed his training in family medicine at the Area Health Education Center in Jonesboro. He joined the Lawrence County Family Clinic in July of 2004. Dr. Spencer enjoys fishing, hiking, reading, and spending time with his family. He and his wife, Ashley have two sons, Henry and William.